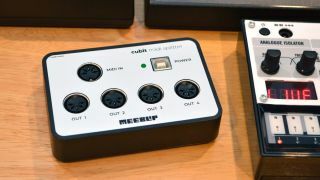 Diddy synth specialist MeeBlip has come up with a simple but potentially useful utility box in the form of the cubit. This is a 4-port MIDI splitter: all MIDI messages received at the single MIDI Input are copied to the four MIDI Outputs. The result is a box that will enable you to share one MIDI Out with multiple pieces of gear and distribute MIDI clock to your setup. Ultra-low latency is promised, and power can come from a computer USB port (note that there are no USB MIDI In or Out ports) or an optional 5v power adapter. With all MIDI ports sitting on its top for easy access, the cubit could be a handy thing to have in your studio. It’s currently available for $39.95 (regular price is $49.95) plus shipping if you’re outside of the US. Find out more on the MeeBlip website.